Anyway, I thought that instead of moaning (ok, I did that a lot this week:sorry to my brother at this point :)) I should do something that improves my mood. I don’t know about you, but the first food that comes to my mind when I need to improve my mood is chocolate. I guess you know that dark chocolate is a moodlifter because of the high percentage of cacao. But dark chocolate doesn’t work for me, I just don’t like it. A real mood-booster for me is white chocolate, not because of the scientific-proofed ingredients, just for the taste! 1.Preheat the oven to 175°C/250°F. Put the muffin cups in the muffin pan. Chop the white chocolate. 2. Stir the egg, sugar and vanilla sugar with a hand mixer until it is fluffy. Mix the yoghurt with the egg and sugar. 3. Sieve the flour, baking powder and baking soda over the bowl with the batter. Stir until the flour is wet, but not too long. 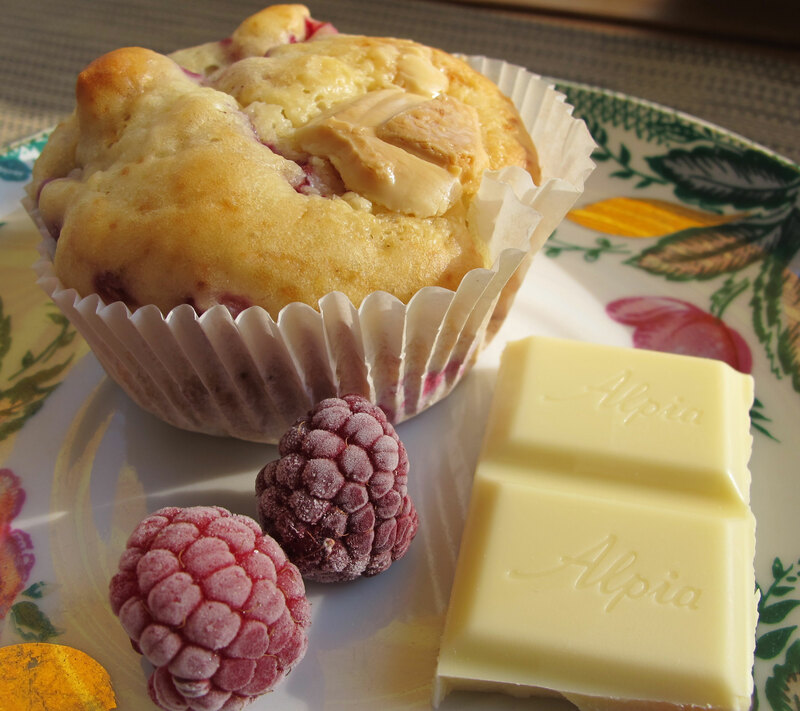 Fold in the almond slivers, 2/3 of the raspberries and 2/3 of the white chocolate. 4. 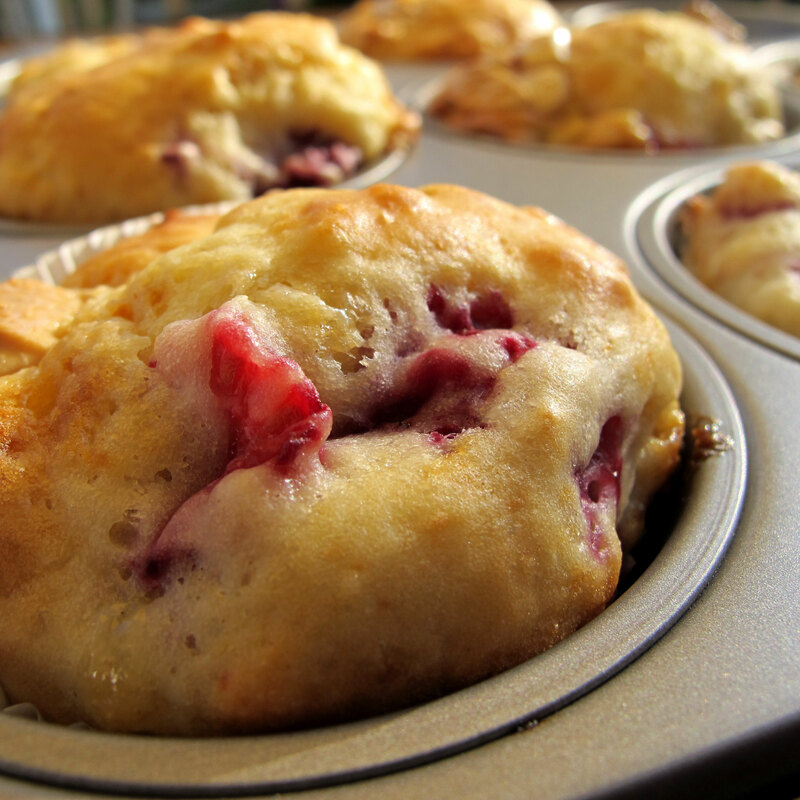 Fill the batter into the muffin cups. Put the remaining raspberries and chocolate on top of the batter. Bake the muffins for 35-40min. 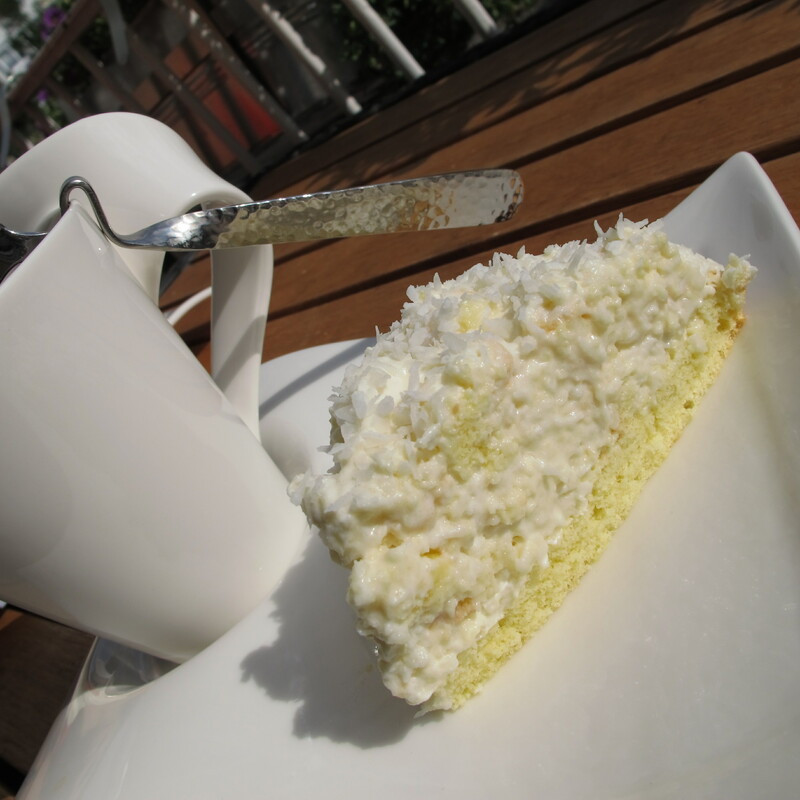 Coconut torte – can childhood memories be sin? This time I want to share a real childhood memory. This is the cake I always asked my mom to bake for my birthday and I loved it! 1. Whisk stiff the egg whites with a pinch of salt. Stir the egg yolks with the sugar, until it gets creamy. Sieve flour and baking powder ofter the eggs and sugar and mix. Gently fold the egg whites in. 2. Heat one cup of cream and add the chocolate until it is liquid (do not cook it!). Whip the remaining cream with the ‘whip it’. 3. Cut the sponge lengthwise in 2/3 and 1/3. The smaller piece is the bottom of the cake. You have to pick the larger one to small pieces. Mix the pieces to the liquid chocolat, coconut grates and whipped cream. 4. Fill the topping onto the bottom. You can use the spring form rand to have an even result. But I prefer the shape of a hill, because my mother always said it looks just like a snow hill this way. 5. After you have the shape you want you can decorate the torte as you like. I used some coconut grates to underline the snow effect. Coconut grates are great if you want to use some food colouring. I am thinking about pink grates on the white ground to get a marshmellow look or something… (I have to bake it again soon!!). 6. 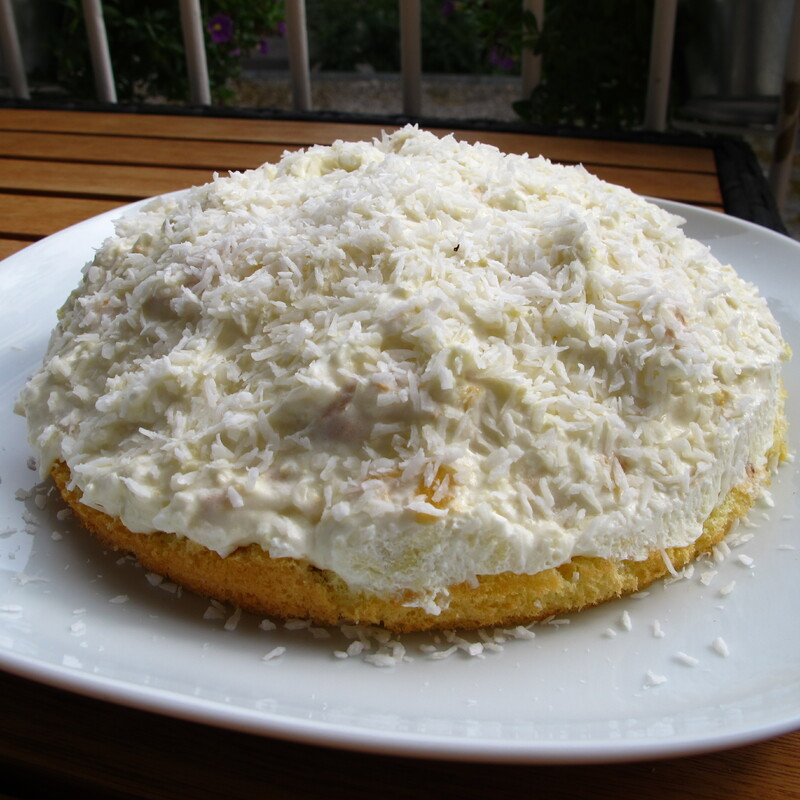 After you are happy with the look you have to put it in the fridge for at least 3 hours and allow the torte to rest.